CEA Leti, Minatec Campus, Grenoble, France. ​18th International Workshop on Micromachined Ultrasonic Transducers MUT 2019. Leti is hosting the 18th MUT workshop that will take place on June 11th and 12th 2019. Initiated in 2001, the MUT (Micromachined Ultrasonic Transducers) workshop has taken place almost every year, in various cities across Europe. MUT gathers researchers and engineers from all over the world to exchange knowledge, ideas, results and perspectives on this new and attractive field. Leti is developing ultrasonic transducers technologies (either CMUT-capacitive or PMUT-piezoelectric) to address new applications. MUT devices exhibit excellent bandwidth characteristics, design flexibility, electronics integration and, potentially low cost solutions in a wide range of markets. Such devices offer a promising alternative to conventional piezoelectric transducers for various medical and industrial applications.  The 18th MUT workshop will take place on June 11th and 12th 2019 and will be hosted by CEA Leti, Minatec Campus, Grenoble (France). The deadline for the abstract submission is April 5, 2019. Abstract submission, technocal program, registration, and details oof accommodation are available on the workshop web site : Click here. Caroline COUTIER, CEA-Leti, Grenoble, France.